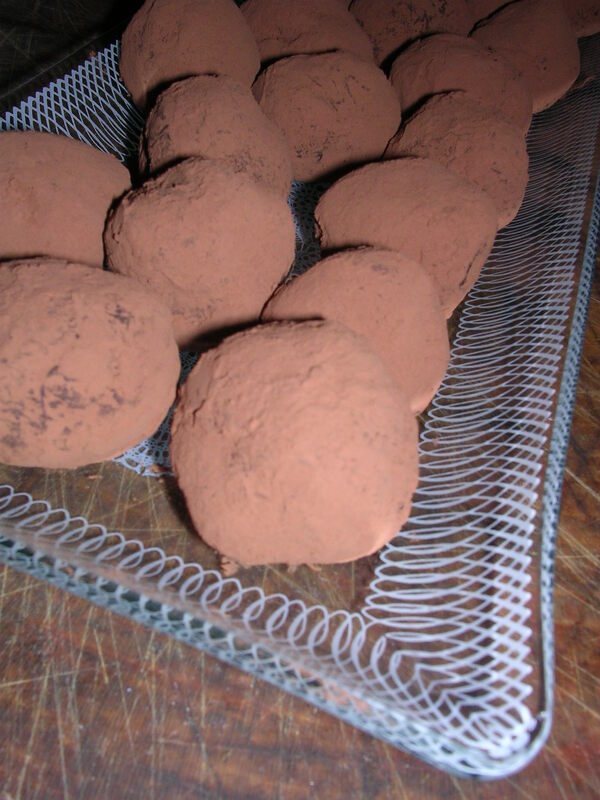 Decadent truffles for your Valentine! Place the chopped chocolate in a large bowl. In a small saucepan, bring the heavy cream to a boil. Pour boiling cream into middle of chocolate and gently stir until smooth with a spatula. Let rest about 1 minute, then quickly stir until smooth. Gently whisk in the butter, 2 pieces at a time, until well incorporated and mixture is smooth again. Transfer chocolate mixture to a baking dish and set in the refrigerator. Cover with plastic wrap when cooled and chill for at least 3 hours. Place the cocoa powder in a low-rimmed bowl. Lay out a piece of parchment paper on your work surface. When chocolate is chilled, remove from refrigerator and using your hands, roll batter into rough 1-inch balls and set on parchment paper. Using your fingers, roll each chocolate ball in the cocoa powder, coating thoroughly, and place back on the parchment paper. Serve immediately or chill in the refrigerator for up to 3 days. NOTE: I added 1/2 cup of crunchy Valrhona chocolate balls to the cooled batter (but before I placed it in the fridge) for some added texture.